In the aftermath of WWI, a grieving German widow encounters a French man who claims to have known her husband. The prolific French director François Ozon had one of the biggest successes at last year’s Venice Film Festival with Frantz, his lyrical reinterpretation of Ernst Lubitsch’s Broken Lullaby (1932). 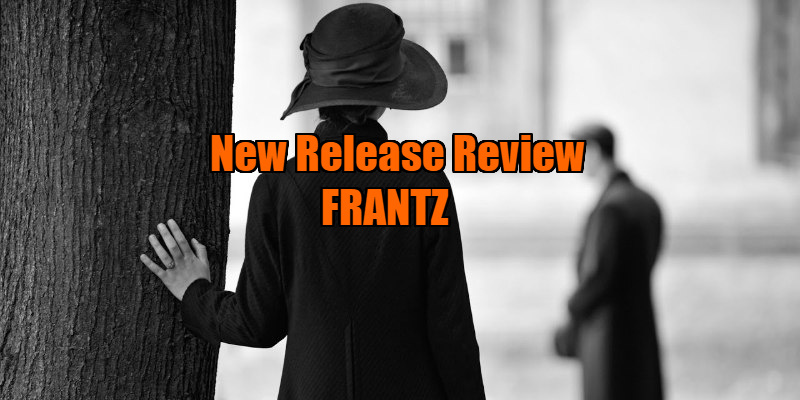 A World War I era romantic-psychological-drama shot in sumptuous black and white that occasionally melts into pastel color, Frantz is worth seeking out for its continental class and its twists and turns, even if it plays it too safe in terms of both its pathos and its malaise. For the first portion of the film, the Hoffmeisters' loss combined with Pierre Niney’s delicately haunted performance make for a genuinely moving experience. This gentle, pained, sophisticated connection certainly draws from the Lubitsch touch of the source material. The rapt expressions on the Hoffmeisters' faces as they vicariously recreate their son’s presence through Adrien’s stories remind one of the sweetly pained look in Carole Lombard’s face and voice in To Be or Not to Be (1942), just as the sumptuous slow blossoming of Anna’s and Adrien’s chaste romance invokes Gene Tierney and Don Ameche in Heaven Can Wait (1943). This gentle sadness is made all the more poignant by the silkiness of Ozon’s subtle and unassuming images. But among the sophistication, Frantz’s first half is occasionally dogged by moments of sticky sentimentality. 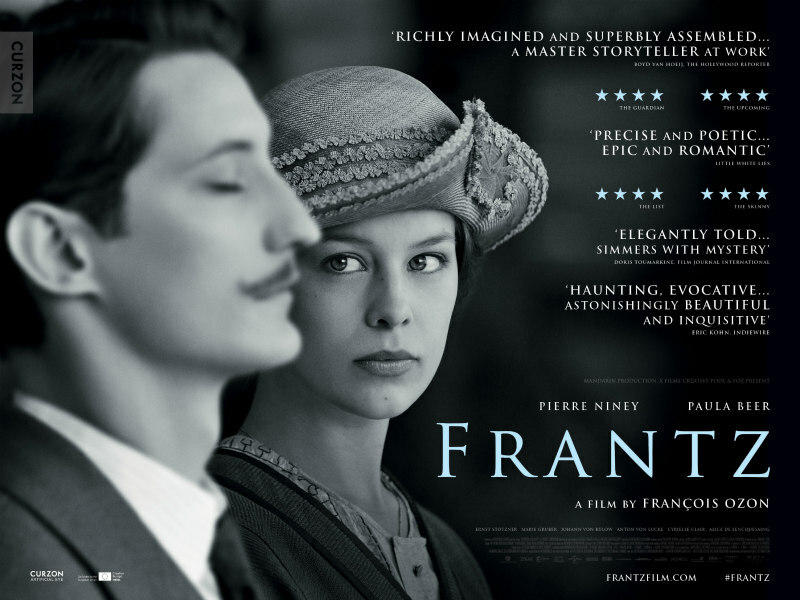 As Hans Hoffmeister (Frantz’s father) learns to overcome the prejudices he harbours against the French through Adrien, we see organic character development; but Ozon draws attention to this development in an unnecessarily didactic speech that Hans makes to his associates about the ugliness of war and xenophobia. It’s a nice thought, but it’s also a cinematically middlebrow way of making a point. And Frantz’s emotional power diminishes even more considerably once Adrien reveals his sinister secret to Anna. This serves to not only push the film’s narrative past the realm of plausibility, but also reveals that what one thought to be genuine feeling was actually building to something more gimmicky than humanist. The revelation of the secret retroactively makes maudlin what was moving. However, the film regains some of its footing when it dramatically changes gears. When Anna goes to France in an attempt to find Adrien later on, Frantz gathers a new kind of momentum, separate but not disjointed from its first half. As Anna searches for Adrien in France, we get a new appreciation for Adrien’s status as an outsider; when we first meet Adrien in Germany, we see his status as a foreigner from the German perspective. Consequently, we share Anna’s experience as an outsider when we accompany her to France—when she faces the same kind of xenophobia Adrien faced, the menace takes on a new meaning. This sense of menace is compounded by the mystery of Adrien’s whereabouts in France, thus creating a strong, resonant atmosphere of unease that nicely compliments the first half’s genuinely moving moments (if not the maudlin ones) without feeling too distant from them (largely thanks to Beer’s consistent performance). However, just as the first half loses some of its punch, once Anna finds Adrien in France, the sinister atmosphere loses traction in the film’s final few sequences. Frantz may be a remake of Broken Lullaby, but, through the crispness of its black-and-white photography and the occasionally perverse mysteriousness of the WWI-era Prussian setting, the film reminds one of Michael Haneke’s The White Ribbon. At one point early in the film, Adrien describes a painting he and Frantz had admired, prompting Anna to conjure an image of a work of Boticelli-caliber splendor. When, in Paris, Anna looks for the painting, she realizes Adrien has been referring to Manet’s Le Suicidé. It’s a shocking, unsettling moment—a moment whose disturbing aura Ozon depicts as symptomatic of bigger, more ineluctable human moral failings in much the same way as Haneke. Ozon and cinematographer Pascal Marti use black-and-white cinematography to a similar end as Haneke and cinematographer Christian Berger in The White Ribbon. In both films, as the veneer of society erodes in Germany in the 1910s, the black and white images allow dark shadows to play on the faces of the characters, cueing us to catch on to when they lie, withhold truth, or inflict some deceptive, subtle abuse against someone else. Though The White Ribbon accomplishes this effect with a far more chilling austerity, Frantz doesn’t lack its share of these memorably sinister moments. Though it is often moving, though it is occasionally dark, and though it is generally visually pleasing, Frantz never wholly surrenders itself to the champagne chic of a Lubitsch film just as it never plunges into the murky depths of social ills like The White Ribbon. If Ozon had made a perfect film, Frantz would have been a stunning synthesis of these two non-mutually exclusive sensibilities. Instead, the film merely straddles and meanders between these two modes. That’s not to say Frantz is bad—many of its moments and visuals are very effective. It’s often a beautiful film, but it never floats quite as gracefully or broods quite as darkly as it should. Frantz is in UK/ROI cinemas May 12th.